Monday night I finished up my blog updates and various internet schenanigans and headed for a bite before going home. For some reason I wound up at Stalactites and ate Rissoles and kefthedakia for dinner. I guess it was a decent choice as I had a bit of company from time to time in the forms of Nonda, Eva, and Bianca. I finished supper at midnight moreorless, which was pretty fortuitous timing as Bianca had also just finished her shift and gave me a ride home. We had a good little chat in her van about work and her school (she’s taking a hospitality course) and a few other things before I ventured inside at about 1:30. Nick was still up and I mentioned to him that I had Blades of Glory on my computer (and the movie isn’t even out here for a few more weeks). So it was that he was persuaded to stay up and watch it with me, and might I add that it’s pretty darned funny. He also poured me a scotch and coke, and then another, and one more before we ran out of coke. For some reason, it was decided that mixing with wine might not be too awful. And hence, two episodes of American Dad and one feature film later, I was asleep at about 5 AM, when I’d hoped to leave for Ballarat early the next morning. 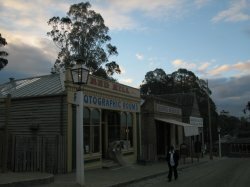 I did leave for Ballarat, but it wasn’t until 2:00 in the afternoon and I knew I’d be racing to get there in time to see the old gold town called Sovereign Hill before they closed and sunset (I was hoping for some sunset photos of the town, actually). And the race was on. 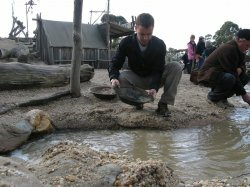 I made it to Sovereign Hill at just past 4:30 and bought a ticket for the night show, called Blood on the Southern Cross, and managed to get in to the town for free since they were closing at 5:00. I strolled through and took some photos of the old town, awash in kids playing and running around. One intersection they’d even set up a cricket wicket. The town itself was pretty great, though, and while I was too late to see all the people in period dress going about their daily business, I did get to poke my head in some old shops and smiths and even an old bowling alley thanks to a particularly nice guy (Stan) who let me in though he’d just closed it and let me toss a ball even. They also seemed to be making snow, though I wasn’t sure why. I then made my way to the YHA just around the corner (though I took several wrong turns to get to that corner) and grabbed a bed before heading out to the show. 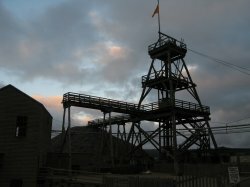 The show itself was educational, I suppose, and when I returned to Sovereign Hill the next day, I could appreciate some of the locations and what I was seeing. For example, I was staying up in the government and military part of town. But if I had paid for both the show and Sovereign Hill, I would’ve felt pretty swindled. Luckily, I didn’t pay to get into the town itself, though I should say that the town was worth the admission for sure had I not paid too much for a pretty poor show. There was plenty of ‘snow’ lining the roads of Sovereign Hill that second day and a lot more activity. 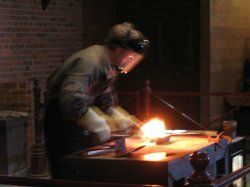 I watched a guy pour an $80k bar of pure gold, I did a little mine tour, panned for gold, and got the full experience this time. Stan remembered me from the day before and I mentioned that I had no idea what I was doing panning for gold and he said he’d show me or get one of his friends to after lunch if I was still around, which again, was very nice. 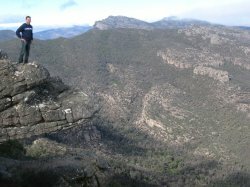 Unfortunately, I wanted to be in the Grampians as early as possible which meant I had to pass his generous offer and settle for pretending I knew what I was doing. So I drove from Ballarat on to Halls Gap, after stopping to top up my phone again and also taste some wine just north of Ararat. I decided to forgo the YHA in favour of Tim’s Place, which I think was a wise choice. Tim is a super nice guy, and he offers up free wireless plus free bikes and lots of help picking trails. Plus, I had the place to myself for the night, which I was reluctant about at first, but I rather liked it. By the time I left to grab a bite to eat (all I had were Anzac cookies at that point) it was dark. As I was getting into my car, I heard a noise in the bush behind me. I stopped. Nothing. I started to turn the key and a noise again. I peered into the darkness and it surrounded me. I quickly opened the door and got in the car, thinking I should look in the backseat for my piece of mind and then shaking my head and starting the car. As soon as I put the car in reverse, I saw what had been making the noise – a big kangaroo. So I went and had some kangaroo fillets from a nice restaurant down the road called the Kookaburra. That’ll teach ‘em to scare me. Plus, I wanted to try kangaroo that wasn’t in burger form. Pretty good, actually, nice and tender, and in a delicious sauce that I had to order garlic bread with just to sop it up. Afterwards, I hung around the hostel trying to keep warm after that. It was a freezing night, absolutely cold. The next morning I set off on my first hike, right out the backyard of the hostel and up to Clematis Falls. 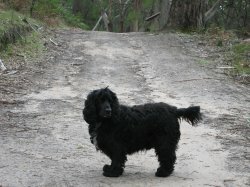 I had company for the hike in the guise of Tim’s dog, Black Pudding. I would say that he followed me up the hill except for the fact that he lead the way – correctly across almost the entire track. Only at the top of Chatauqua Peak was it too steep for him to bound up the rocks, though he made it quite a ways. I laughed that he hadn’t been up to the peak much as I made my way down because he took the wrong way. I walked on, figuring he’d follow but after a bit, he still wasn’t there. I was about to call him when I saw him sitting on the path in front of me, waiting. I guess he wasn’t the one that took the wrong way. The peak was really nice, a great view of the valley afforded, but the falls were nothing to write home about. Nice, but I’ve been spoiled time and again on this trip and it didn’t compare. Still, a 5.6km trek was a good way to start. 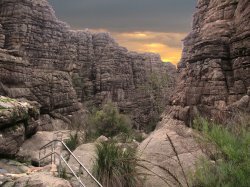 I went to the Info Centre after since time was ticking and I wanted a little more help on picking the most must-see hikes here. 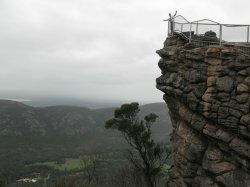 They were quite helpful and sent me up to Wonderland car park to start a hike to The Pinnacle through the Grand Canyon. This was a much nicer hike. Sure, there were some embarrassing ‘features’ that should never have been named much less signposted, namely Bridal Veil Falls, but the Grand Canyon was a beautiful and impressive walk, and the Pinnacle gave some great views from an outstanding outcropping. Or is that an outcropping outstanding. Either way, a nice view even though the weather was pretty poor. This is a definite must-hike while here. 5.5km added to the total, and just enough daylight left to check out the Venus Baths before resting my legs. They were not worth the hike. Sure, it was nice, a smoothed section of rock that the water flowed over and pooled beyond, but if I was hiking specifically to see it (and I was) I might’ve been disappointed. Still, another 2.3km of exercise, bringing the total to about 13.5km. Not too bad considering I didn’t start til after lunch. I went to the pub for dinner that night and chatted with a local who told me about his 40th birthday being spent with tonnes of family and friends camped out in his yard and having a big party, meat on the spit, and BBQ’d bacon and eggs in the morning. I tried to imagine that back home, but I couldn’t. I loved the idea of it, so definitely Australian. I went back and discovered that I wasn’t alone at the hostel anymore. There were two couples and three guys traveling from the UK to keep me company. I chatted for a while but was feeling groggy and developing a headache, so I went to bed a little early. The next morning I woke up and was out the door by 11:00. It was a much nicer day than yesterday, so I wanted to get some decent photos that conveyed how nice this park was. To the extent that I actually hiked back into and up the Grand Canyon a ways to get some photos, most of which still were no good. Then I drove up to Boroka Lookout, where I ran into the Scottish couple that was staying in the hostel with me. 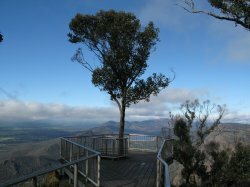 They were leaving as I arrived, but I took some photos of the lookout, which was quite lovely. A boardwalk into emptiness, with a tree in the middle of it. It really looked surreal, I loved it. Definitely a must-see for anyone in the mountains here. Then I drove up to The Balconies, the next lookout on the path. They weren’t that intriguing on their own, but quite nice once you hopped the fence and stood on one of them. The rock really stuck out quite a bit overhanging the valley below and it was pretty freaky to climb out on them, but I figure it made for some good photos. The Scottish couple were there when I got there and we walked to them together and they took my photo as they called me crazy. I then took the guy’s photo as he decided to give it a walk, and I think it’s even more scary to watch someone than to do it on your own. 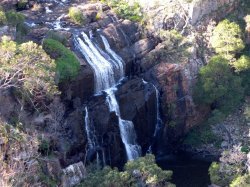 Finally, one wrong turn and a u’ey later, I made my last stop for the day at Mackenzie Falls. There was a steep track to the bottom and also one that looked down from above. It was around here that I realized that I had underestimated the trip time to Melbourne by about an hour and midway on the track that I had left my pants at the drycleaners and had to be back an hour earlier since they closed at 6:00. So I ran the trail as much as I could, enjoyed Mackenzie Falls for enough time to get some photos and catch my breath, and jogged back to the car. The Scottish couple was still snacking in their car, but I gave them my room key (which I’d forgotten to return) and hit the road fast. I stopped once for gas ($1.36/litre!) and once for fuel (I knew I’d need to eat while driving, so an HJ was in order). I made it back, traffic and all, about 40 mins faster than I was supposed to at, shall we say, legal limits, which is all the more impressive because I’d also forgotten it was a long weekend and traffic was not light. In fact, I made it back to Nick’s at about 5:30, which gave me just enough time to throw my stuff on the ground and run to grab my pants. With a sprint, I just managed to catch the tram, and made it to the dry cleaners with 14 minutes to spare. I ran back home, jumped in the shower, shaved, and ran out the door, but the tram that was supposed to be there wasn’t. So I ran down the street to see all these other trams heading along my street that aren’t supposed to run in that direction. There’d been some sort of tram accident, I guess, and by now it was looking likely that I’d be late for work. I walked down the street as fast as I could and managed to flag down a tram finally, making it into work exactly 30 seconds early. Not bad for going flat out since 11 that morning 300km away and squeezing in three mini-hikes. Whew. Finally, work that night went quickly, and was fun because Paris and Kirsti were both working and are lots of fun, plus Andrew and Heather were there until midnight and they’re both fun to work with, too. Kirsti gave me a lift home and we hung out a bit before I slept a hard-earned sleep. 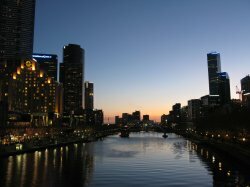 Coming up next, my last few weeks in Melbourne.